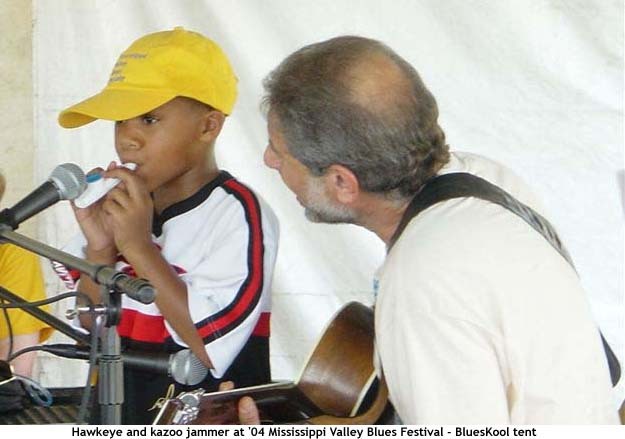 click to watch & listen NPR radio interview with Hawkeye on the importance of blues education. 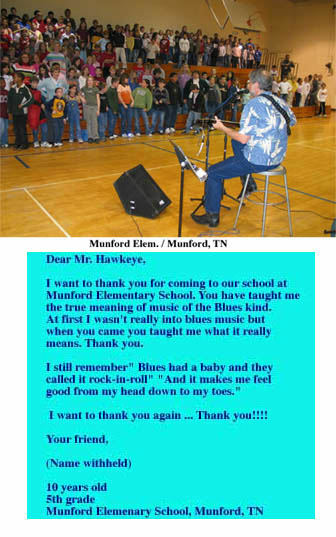 click to watch & listen "The Blues Had A Baby" - Hawkeye song for all students. 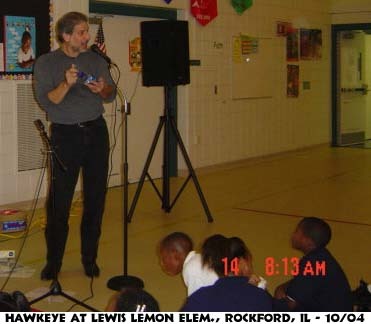 2019 marks Hawkeye's 41st year of "Blues in the Schools" programs. 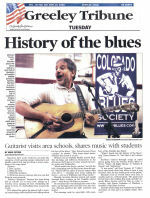 He began this effort long before most blues support organizations and festivals even existed. 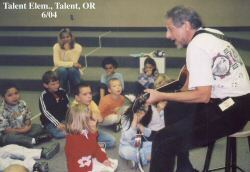 Since that time Hawkeye has helped to initiate educational programs for many blues societies, and he has single-handedly introduced blues music workshops to major festivals, including; the San Francisco Folk Festival, The Northwest Folklife Festival (WA), the Mississippi Valley Blues Festival (IA), the Sonoma County Folk Festival (CA), the Tumbleweed Music Festival (WA), the Rogue Valley Blues Festival (OR), the Paramount Blues Festival (WI), the Willamette Valley Blues & Brews Festival (OR), the Blues sur Seine Festival (France), the River Music Camp (CA), and at the International Blues Festival (in Cali, Colombia). 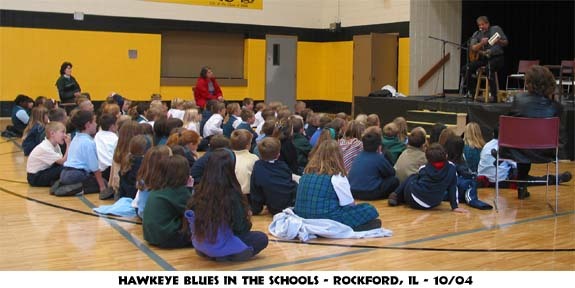 Hawkeye has presented his "Blues In The Schools" programs in more than 500 schools (all levels; from elementary schools to the college level), in 30 states in the USA, in 10 foreign nations, and to over 1/2 a million students. Click to view article. Requires Adobe Reader. 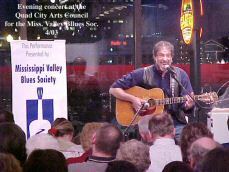 Delta Blues Symposium, Ark. St. Univ. 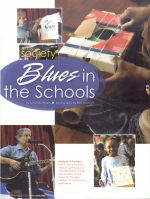 Blues musician Michael "Hawkeye" Herman was recipient of the Blues Foundation's 1998 "Keeping the Blues Alive" Award for achievement in education. The honor was presented at the KBA Awards Banquet, on May 1st, 1998, in Memphis, TN. He served for six years on the Blues Foundation's Board of Directors, and was the chairperson for the Foundation's committee on education. 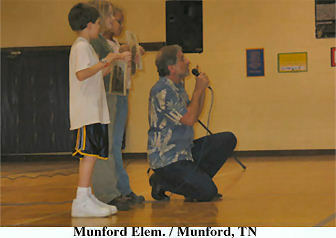 His selection for the "Keeping the Blues Alive" Award is the result of 24 years of dedication to bringing blues music to students of all ages through his "Blues in the Schools" program and his helping initiate such programs for blues societies, as well as educational workshops at blues and folk festivals. 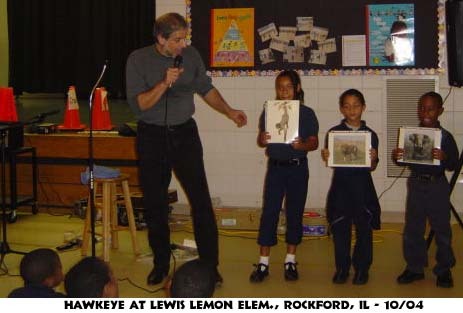 Hawkeye has reached out to a diversity of students, from pre-school to the college level. The list of institutions that have benefitted from his presentations ranges from Stanford, Colorado, and Arkansas State Universities, to elementary, junior and senior high schools throughout the nation. 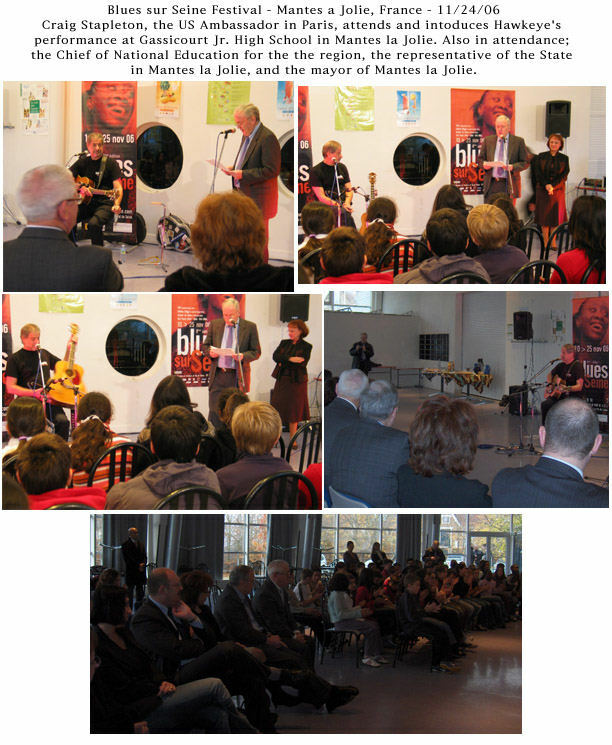 He credits the support of blues clubs and societies for the rise in interest in blues music, and for helping to bring "the watershed of American popular music" to young people. Hawkeye has two types of in-school programs to choose from. One program is a one-hour per­for­mance/concert that is done for the entire school in an assembly format. 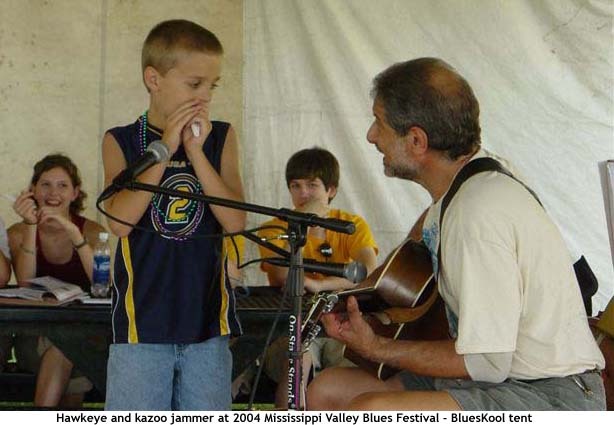 In this pro­gram he introduces the students to the roots of American folk/blues music, and the influence it has had on contemporary popular music and culture. The second program is a full day spent with the children. This is usually done by combining classes of the same level (i.e. : all first graders in one group, etc., through­out the day), and focusing on material that each level is capable of understanding. Because he is aware of the differences in attention span and comprehension that exists between a child of five and a child of twelve at the elementary level, he is able to gear each class toward their interests/abilities, while making the learning experience fun. His fees are set up to create incentive for the all day program. However, he is not adverse to doing a single one-hour performance. 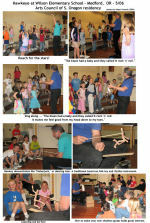 "Hawkeye" enjoys approaching the children on the appropriate level. The full day arrangement allows him to do so. 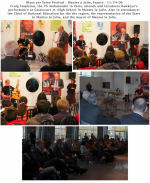 Two and three day residency programs are also available, as well as extended residencies of one to two weeks. 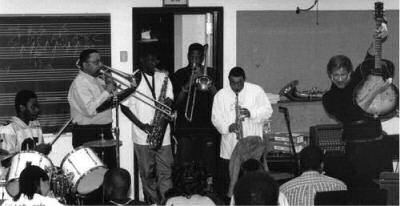 In these extended residencies he is able to teach the history and significance of American roots music, its relationship to geography, social studies, and other arts, as well as instruct students on how to write blues songs, compose and arrange music, and even make their own instruments. 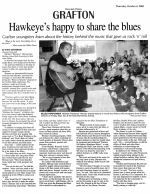 "My mission is to let young folks know that the blues is an important aspect of American music history, influencing other styles of music in the past, right up to the present," Hawkeye states. "Blues is the real deal, the story of the human experience, and that will always hold a place in the hearts and minds of the people. 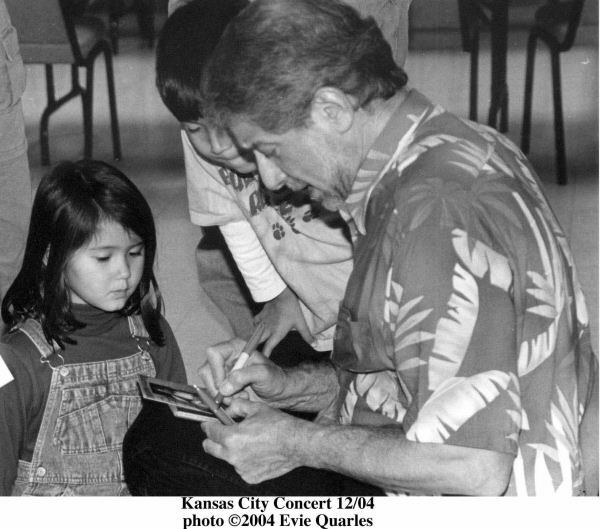 I'm trying to ensure, through my educational programs and workshops, that future generations are aware of their own rich musical heritage. "The personal satisfaction of doing what I love, combined with reaching out to people, are wonderful rewards in themselves. 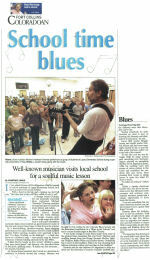 I am most honored, grateful, and encouraged to be recognized for my efforts by the Blues Foundation." 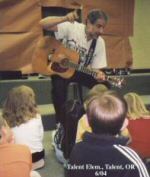 For information on Blues in the Schools Programs, K - 12, Workshops, Seminars, Symposiums, and Residencies contact Topaz Productions.